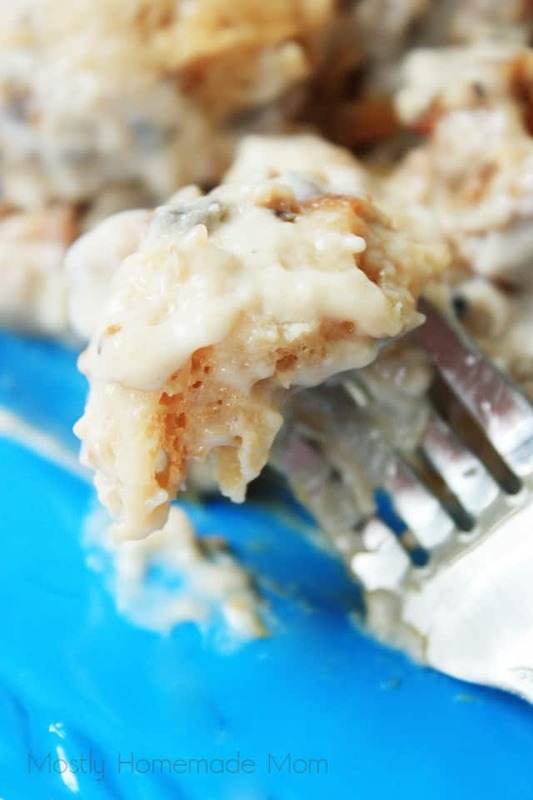 Slow Cooker Biscuits and Gravy are the perfect make-ahead breakfast! 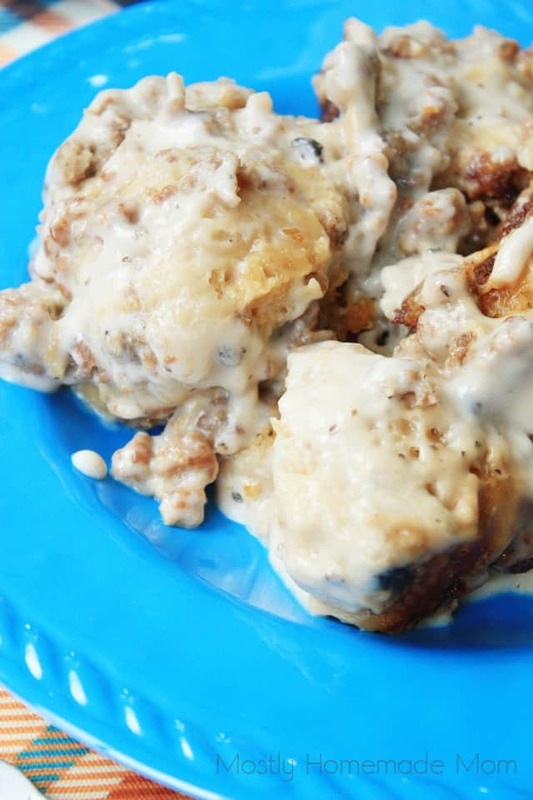 Sausage in a creamy gravy and refrigerated biscuits – your family will go crazy for this breakfast recipe! 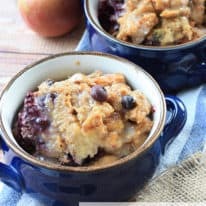 I’m not so sure what it is about fall, but I’m always pinning and saving great breakfast recipes to use when the holidays roll around. I think it might be the cooler weather and the cozy feeling I get spending time cuddling with my kiddos under blankets that get me in the mood for breakfast food. It’s pretty funny, but I sometimes pout that we never get to go out to breakfast anymore. We used to go when we were first married a lot, but you know how it is with little kids. Going out to eat is just more trouble than it’s worth – and I’m definitely not doing it before my morning coffee! We usually have a few family members over during the holidays, specifically Thanksgiving and the following weekend, and I’m going to try and be much better with making breakfast at home. My usual routine for overnight guests is sending Paul out to pick up a dozen donuts and getting the coffee brewing. That’s not all that bad, though! I’m definitely planning on a large batch, possibly double batch, of Slow Cooker Biscuits and Gravy for the morning after Thanksgiving. It’s absolutely delicious, warm, and super filling. Plus, having the slow cooker do all the work for me through the night sounds like a heavenly morning to me! 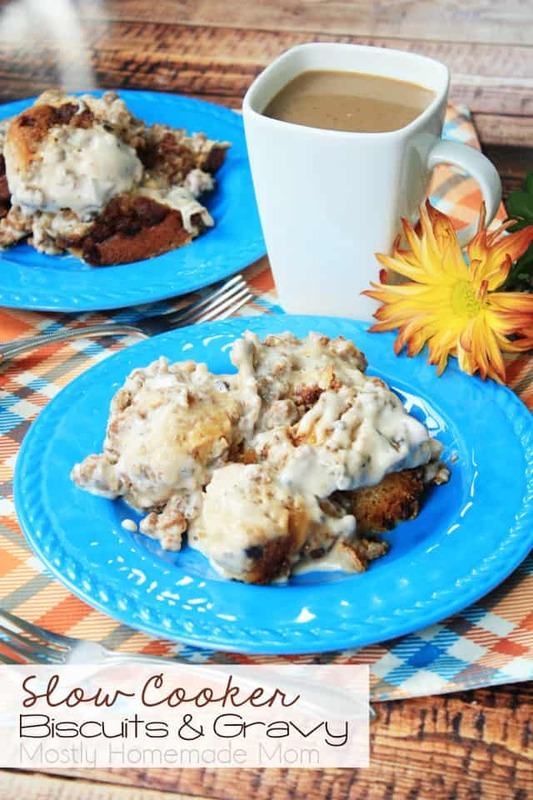 Slow Cooker Biscuits and Gravy are the perfect make-ahead breakfast! 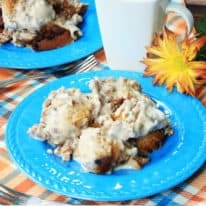 Sausage in a creamy gravy and refrigerated biscuits - your family will go crazy for this breakfast recipe! In a deep skillet, brown ground sausage. Drain and return to pan. Grease the bottom and sides of a slow cooker. Open one can of biscuits and lay the biscuits in the bottom of the slow cooker. Sprinkle half of sausage crumbles over biscuits. Spoon one can of cream of mushroom soup evenly over sausage. Repeat layers with remaining biscuits, sausage, and ending with cream of mushroom soup. Cover and cook on low for 4 hours. Refrigerate any leftovers. 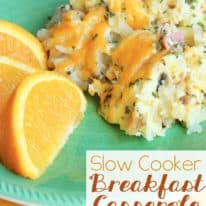 This recipe only cooks for 4 hours on low in the Crockpot, so if you have a machine that has a “keep warm” function, that would be ideal if you were using this to prepare the breakfast overnight. You could also cook it on high for 1 1/2 – 2 hours as well – just watch the edges of the biscuits in case they get over done. Either way, this breakfast will be absolutely delicious! 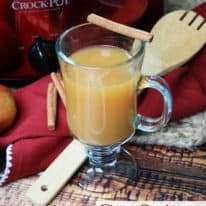 Could the cream of mushroom soup be substituted with Country Gravy and still come out the same? Hmm that’s a good question! I’ve never tried that with this recipe so if you do, be sure to come back and let us know how it turned out! There’s something seriously wrong with anyone who uses cream of mushroom soup as gravy. No self respecting southerner would touch that with a enemies tongue. Bless your heart.